With the application of heat Adhesive Lined Heat Shrink Tubing shrinks to a tight fit, forcing the adhesive lining to flow and cover the substrate. When cooled the adhesive forms a permanent, flexible and waterproof barrier. The tubing is availble in a standard 2 to 1 shrink (product #BD331), and also as a 3 to 1 shrink (product #BD332) for hard to fit applications. For larger diameters see product #BD335 Heavy Wall Polyolefin Tubing. 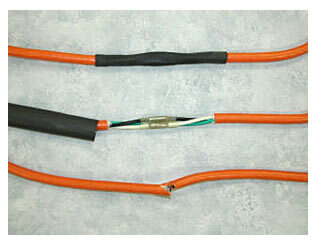 Medium Wall heat shrink tubing is a thermally stabilized, modified polyolefin, heat shrinkable tubing. It provides a simpler, more positive splice sealing method that offers greater protection under the most adverse environmental conditions. A relatively small number of sizes covers a large number of cable sizes because of the high shrink ratio. Seals may be made over lead, steel, aluminum, copper, and all standard plastic and elastomeric insulating materials. The standard tubing is supplied with an adhesive to provide optimum water-proofing and environmental protection in submersible or direct buried applications. This tubing can also be supplied in heavy wall (product #BD335- below) where a thicker wall is needed. Both tubings are rated for continuous operating temperature up to 90°C for non-pressurized cable systems. 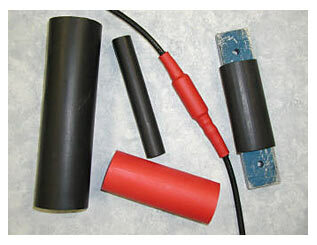 Heavy Wall heat shrink tubing is a thermally stabilized, modified polyolefin, heat shrinkable tubing. It provides a simpler, more positive splice sealing method that offers greater protection under the most adverse environmental conditions. A relatively small number of sizes covers a large number of cable sizes because of the high shrink ratio. This tubing can also be supplied in medium wall (product #BD334- above) where wall constraint is a factor. 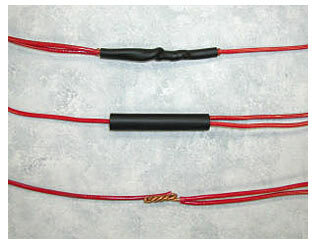 Both tubings are rated for continuous operating temperature up to 90°C for non-pressurized cable systems.